Former Lt. Col. Mark Savage has been selected to serve in the newly created position of Colorado State Patrol Deputy Chief, effective Nov. 1, 2016. During the summer of 2016, Chief Scott Hernandez decided to hire a Deputy Chief to assist the Chief’s Office in efforts to align operational business practices, increase organizational accountability and assist in the overwhelming demand for Colorado State Patrol representation within the communities we serve and with our allied partners across the country. Deputy Chief Savage was selected from a very competitive, highly qualified field of applicants. Savage has served with the Colorado State Patrol for more than 21 years, bringing leadership, knowledge and management experience to the Deputy Chief’s position. Chief Hernandez also selected Major Barry Bratt as the next Lt. Colonel of the Colorado State Patrol. Lt. Colonel Bratt has over 30 years of dedicated law enforcement service. Although both promotions are effective November 1, 2016, both Deputy Chief Savage and Lt. Colonel Bratt will be promoted at the December 16th promotion ceremony. Deputy Chief Mark Savage has been with the Colorado State Patrol since 1995. He is currently responsible for the day to day operations of the Colorado State Patrol. Mark has worked in the State Patrol’s field operations, Executive Security Unit but focused the majority of his career on improving commercial vehicle safety. In 2012 the Colorado Port of Entry was transferred to the Colorado State Patrol and then Major Mark Savage was tasked with successfully integrating the largest ever expansion of personnel in CSP history. In 2013, Major Savage transferred to District One as the district commander and was assigned all Denver Metropolitan field troopers and the Executive Security Unit. Deputy Chief Savage was promoted to the rank of lieutenant colonel on July 1, 2014. Deputy Chief Savage has been an active member of the Commercial Vehicle Safety Alliance serving as the organization’s President in 2012 and 2013 and is considered a subject matter expert in commercial vehicle safety for the state and the nation. 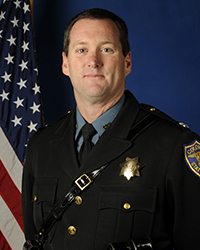 Deputy Chief Savage has a bachelor’s degree in political science and history from Coe College in Iowa and is a graduate of the 256th Session of the FBI’s National Academy. Deputy Chief Savage also is a graduate of Northwestern University School of Police Staff and Command session #304 and the 63rd Session of the Senior Management in Police training at Boston University.